Gone are the days when groom’s wedding suits options were confined to tuxedos or traditional morning suits. In today’s time and age grooms just have as many options as brides. Groom’s wedding suits and groomsmen suits have to in sync with brides dress and the rest of the wedding theme. Its winter time in Australia and one of the most popular wedding theme for the season is Vintage. However it can be challenging to have a vintage wedding suit. It would be next to impossible to find off the rack wedding suits that will hit the vintage brief to perfection but with tailor made wedding suits it should be like a walk in the park! If you are looking to channel your inner country gentleman and make a statement on your wedding day then opt for fabrics like tweed, plaid or houndstooth. These are fun and bold fabrics that will give your wedding suit a rustic and casual feel. Vest is a perfect vintage accessory. Vest can be done in matching fabric to your suit or can be done in contrasting colour or fabric. If you are not the kind of person to wear full tweed suit, then get a vest in tweed to add the extra texture to the suit. 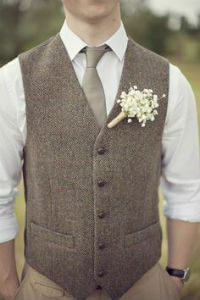 Vests definitely make you look dapper and give some extra warmth for a winter wedding. Suspenders would work well if one is looking for a more rustic and relaxed wedding. Or if you are a man on a budget and do not want to spend the extra money on the vest and still get the vintage look then go for braces/suspenders. You could match your suspenders to your suit or if you want to experiment then match it to the bow tie or shoes.